As much as I love my iPad, the Macbook Air is where all my work gets done. The obvious reason being is the iPad’s lack of hardware – keyboard. This Bluetooth Keyboard and Case from Snugg is just what I needed in order to put my lazy tablet into full working mode. The iPad turns into a stylish mini laptop as it docks onto the device. The keyboard is also a protective cover for the iPad when not in use. Smart! 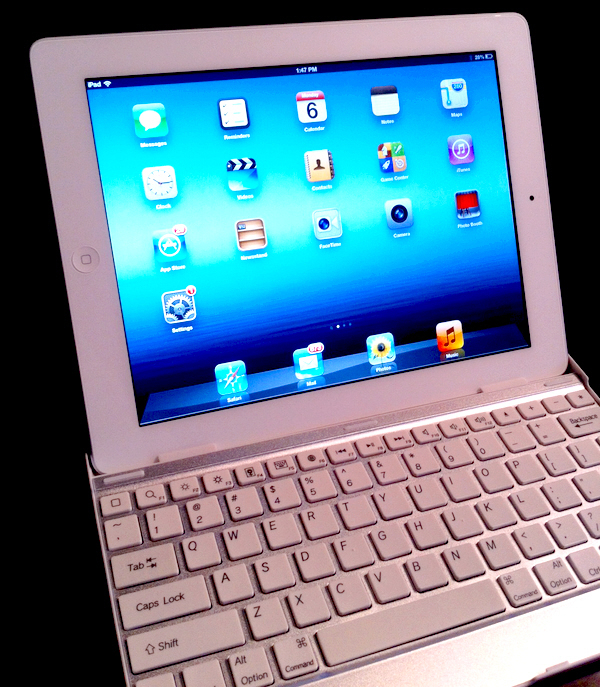 Aluminum finish and white keys to match the sleek look of iPad. Keyboard and protective case in one. Fast setup and charging time. Snaps easily onto the iPad. The placement and smaller size of keys (especially the space key) requires some time getting used to. I’ve used this keyboard to write blog posts, To-Do lists, emails and practically everything else I do on my laptop (except the Photoshop where I need a bigger screen). Having an actual keyboard allows me to be more productive while getting things done quicker on my iPad. Although I would like to try out other iPad keyboards as a comparison, I find this keyboard a decent value overall at the sale price of $49.99. On a side note, Snugg’s live help chat was quite helpful along with their responsive customer service. Disclosure: I received a sample for review purposes. The opinions are completely my own based on my experience.